When we arrived at the arboretum, Rohan and Kavita’s families were there setting up to surprise Kavita with candles and a framed display: so sweet! There was so much excitement as they figured out where they were going to hide and watch everything unfold. It’s safe to say she definitely did not see this coming! Rohan told Kavita that his workplace was hosting a get-together in the arboretum and invited her along. He even suggested she change her shoes from flats to heeled sandals, but she was oblivious to the reason why! As they walked towards the arbor, Rohan talked about the first time they met, and Kavita finally understood what was happening as they approached the arbor. We love the sweet moment where Kavita leaned down to give Rohan a tear-filled hug as he was down on one knee! Right after he popped the question, their families emerged from their hiding places to celebrate! 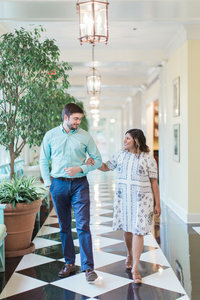 We were able to get some photos of the family with the newly engaged couple and then walked around the gardens with Rohan and Kavita to capture their very first engagement photos! Rohan, thank you for asking us to take these photos and trusting us with them! We so loved getting to meet you and Kavita and wish you two a lifetime of happiness together! Want to see more engagements? Head here! Or if you’re ready to book one of your own, start by sending us a quick message!